California is known by many as the land of beautiful celebrities, packed freeways, and perpetual summer. But the nation's third-largest state also has a huge variety of people with very distinct ways of speaking, from valley girl speak to surfer lingo to slang inspired by Bay Area hip hop. The people of the Golden State speak a dialect distinct enough to warrant its own name: California English. Inspired by Business Insider's recent roundups of expressions from the South, Midwest, and New England, we've come up with 12 sayings that only people who hail from the Golden State will understand. 1. "There's a Sigalert for the carpool lane on the 5 south." Freeways are a huge part of Californians' daily existence, so of course there are plenty of slang terms associated with it. Californians may be the only people in the country to put "the" before the number of a freeway route (and they're never called highways), and the only people to call it the carpool lane instead of the HOV. And if there's a Sigalert, take it as a hint to avoid the area completely. Sigalerts are messages issued by the California Highway Patrol when there's an accident or anything else blocking multiple lanes of traffic, meaning that notorious California traffic is even more horrendous than usual (see also: Carmageddon). 2. "It takes 20 minutes, depending on traffic." People from California say this all the time to describe their location, and it's barely ever true. 30 minutes just sounds way too far, and 15 minutes is unrealistic. We all know that 20 minutes away really means something closer to 40, and that light traffic is never something you can depend on. Beginning in June (or even at the end of May if it's a particularly unlucky year), a wave of foggy weather invades coastal areas of California and ruins everyone's beach plans. June Gloom/Grey May/No-Sky July are southern Californian terms used to describe a weather pattern that brings low-lying clouds and mist during the early summer months. Though people from out of town will try to convince you it's just air pollution, the fog that appears every morning usually clears up by mid-afternoon or so. 4. "The coldest winter I ever spent was a summer in San Francisco." This San Francisco cliche is usually attributed to Mark Twain, though there's no evidence he ever actually said it. Contrary to what pop culture may have you have believe, summer in the Bay Area is pretty cold, and fog is a nearly constant presence. The fog may be a nuisance to visitors touring the Bay Area, but San Franciscans embrace the fog as an essential part of what makes their city home. Surf culture basically has its own lingo. 5. "It's pretty gnarly out, bro. It's double overhead today!" Surfer culture has had a huge influence on the way Californians speak. You may hear surfers, skaters, and snowboarders talking about "shredding the gnar," but even those who refrain from participating in extreme sports tend to use the word "gnarly" to describe things that are either extremely good or extremely bad. You'll also hear words like "epic," and of course, "dude." Waves that are "double overhead" are not meant for the faint of heart. Though Merriam-Webster defines "stoke" as "to stir or add fuel to (something that is burning)" this expression has absolutely nothing to do with building a fire, at least in a literal sense. Californians are stoked when they're totally, completely exhilarated about something, whether it's a trip to the mountains or a huge swell coming just in time for the weekend. Now a commonly used word in many regions, "stoked" became popular with "The Endless Summer," a classic surfing movie documentary by Bruce Brown in 1966. Perhaps one of the most distinctive and divisive words on this list, the use of the word "hella" is an immediate indication that the speaker is from northern California. Derived from "hell of a" or "hell of a lot," the word is generally used in place of "really," "a lot," or "very." Don't get caught using this word in the southern part of the state, however. You'll only hear people from the Bay Area say this, while people from elsewhere in California will probably find the term annoying. Vague references to "the industry" might be a little confusing to people not from southern California. When someone says their husband works in "the industry," they don't mean he's an industrial worker, though he may belong to a different kind of labor union. Actors, directors, producers, screenwriters, art directors, film editors, and talent agents are just a few people who make up the huge entity that is "the industry." Show business is so prominent, especially in Los Angeles, that Californians should automatically get the reference. 9. "This burger is bomb." We've all heard people refer to things as "the bomb" since the late '90s. Californians often put their own spin on this outdated expression by taking out "the." It's usually food items that are referred to as "bomb," though theoretically anything awesome could be referred to in this way. In N' Out burgers, "animal style." 10. "I'll take a number 2, animal style." 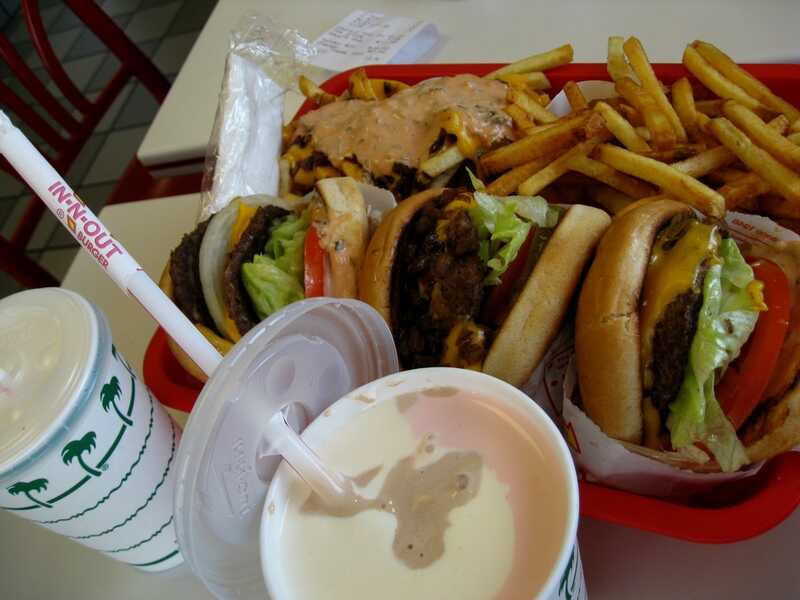 Californians are deeply proud of their In N' Out, a fast food burger chain that comes with its own jargon and a secret menu not advertised in stores. A burger served "animal style" has mustard fried into the patty and comes with extra spread and grilled onions. You can also order your fries animal style, or if you're especially hungry, try a 3x3 burger, which comes with three beef patties, or even a 4x4. 11. "This burrito is dank." "Dank" is a prime example of a term whose meaning has changed from negative to positive thanks to slang usage. Though Merriam-Webster defines it as meaning "wet and cold in a way that is unpleasant," as in a dank basement, the word was adopted by stoner culture to describe high-quality marijuana. The word has since evolved to describe anything that is especially good, like an exceptionally tasty burrito. 12. Whatever you do, definitely don't say "Cali." It seems that the only people who don't refer to California as "Cali" are the Golden State natives themselves. You will very, very rarely hear a Californian call their home state by this name, despite the fact that people from everywhere else love to call it that. If you want to blend in, try not to use this shudder-inducing word in the presence of California natives. Publicado por Agustin Besoain en 12:08 p.m.